But additionally, Rose City Antifa would recommend that the city begin by cleaning house by removing certain bigots and racists currently working for the City of Portland. The saga of Nazi Cop Mark Kruger is well-known at this point, as is the City of Portland’s lack of accountability for his construction of a Nazi shrine in a Portland city park. Kruger would be an obvious first choice if the city were interested in backing up its resolution with concrete changes. 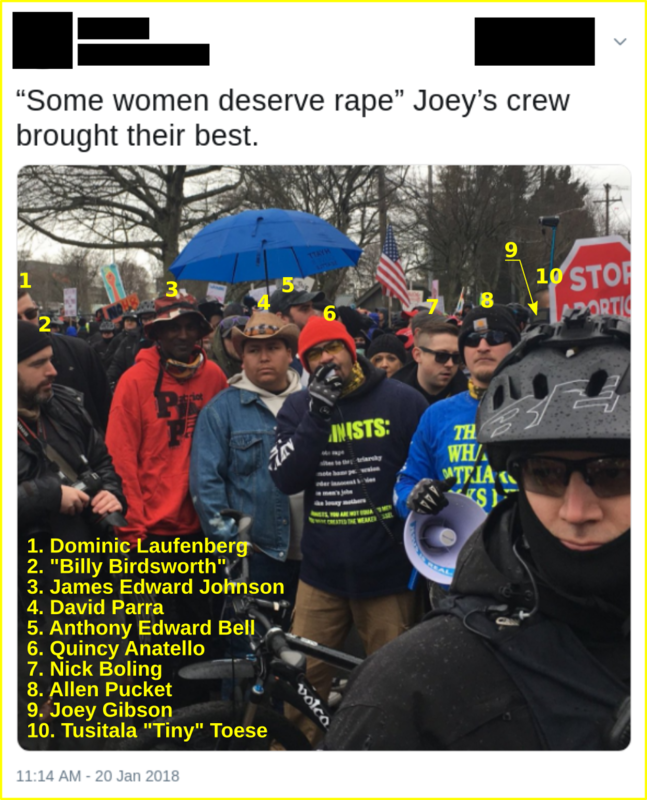 But additionally, it has recently come to the attention of Rose City Antifa that two other bigots are currently employed by the city, who are both actively involved in organizing geared toward enabling racism, white supremacy, homophobia, misogyny, and hateful violence: Quincy Lee Franklin, and Gregory Norman Isaacson. 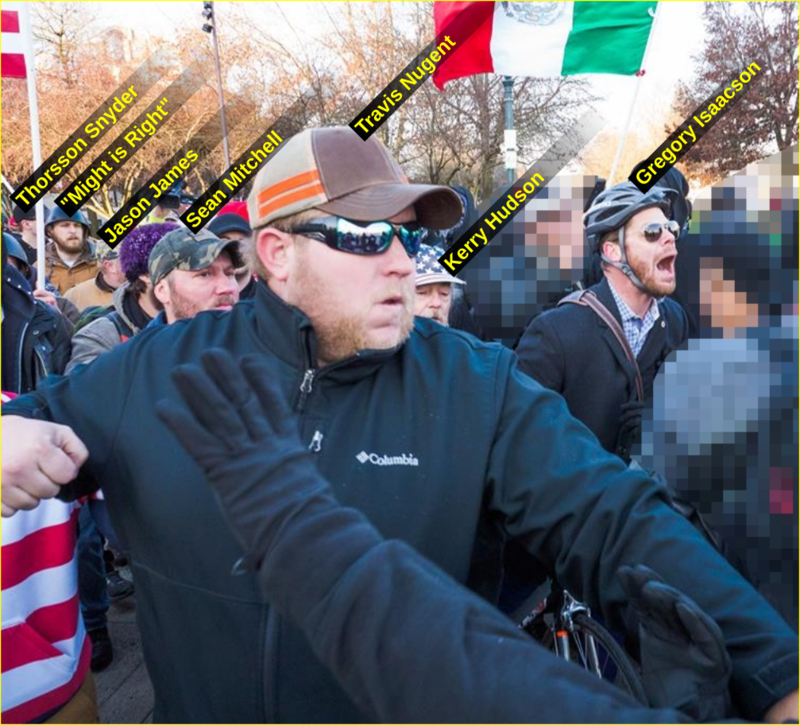 These two individuals have been organizing with Patriot Prayer, the Proud Boys, and other bigotted and white nationalist groups, and have been in attendance at the events in Portland over the last two years which the city leadership claims to oppose. 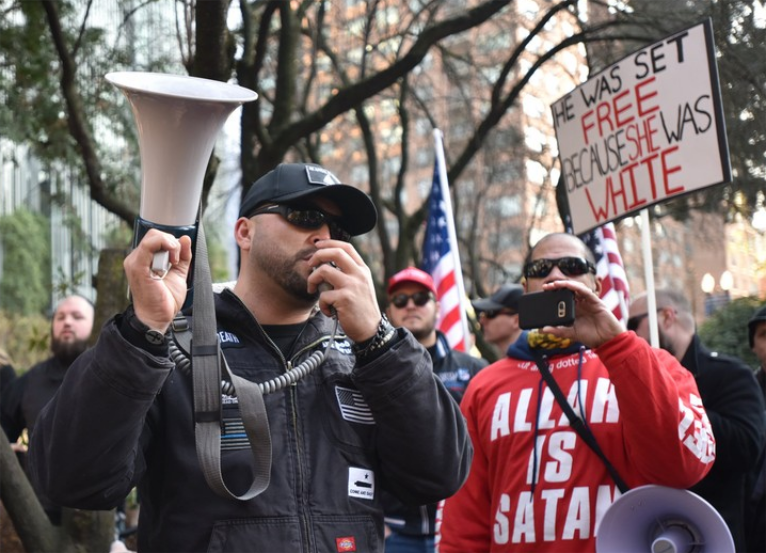 (Left) Quincy Franklin wears one of his many homophobic garments, (Center) Franklin and violent Patriot Prayer and Proud Boys member Tiny Toese are seen rallying with neo-Nazi MAX murderer Jeremy Christian at Joey Gibson’s April 29, 2017 Montavilla hate rally, (Right) Quincy is seen with violent white nationalist hate preacher Allen Pucket. 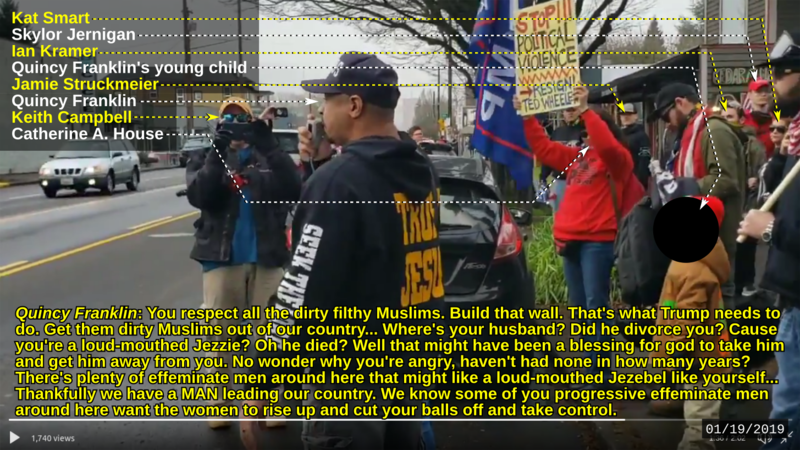 We have written about domestic abuser, misogynist, and virulent Islamophobe Quincy Franklin before, and often pointed out his collaboration with extremely violent and openly white nationalist hate preacher Allen Pucket as well as his membership in Pucket’s hate group “Hell Shaking Street Preachers.” Franklin, a current employee of the Portland Water Bureau, often takes to Portland’s streets not just to locate buried water pipes, but to assault, intimidate, and harass members of the LGBT+ community, Muslims, and immigrants. 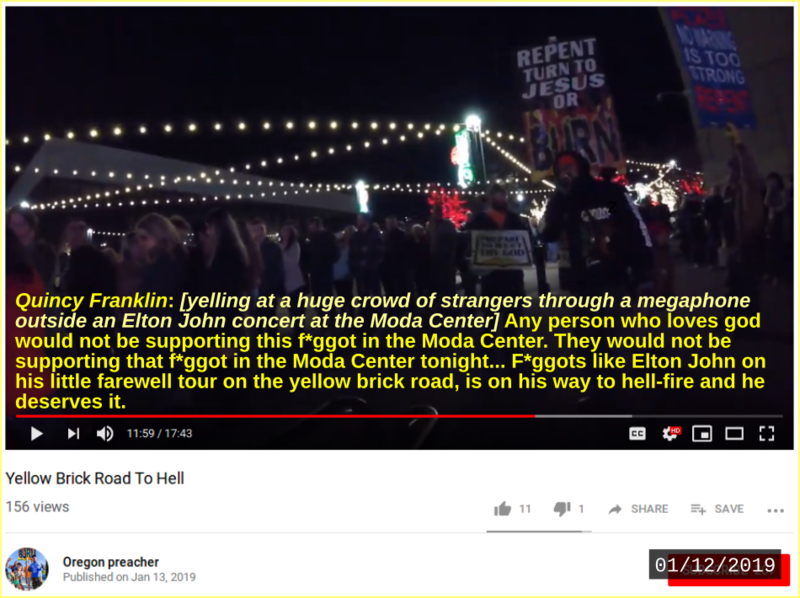 Quincy Franklin yells homophobic abuse at people attending an Elton John concert in Portland on January 12, 2019. Quincy Franklin, backed by violent Patriot Prayer members, yells Islamophobic and misogynist abuse at Portlanders who are eating brunch. 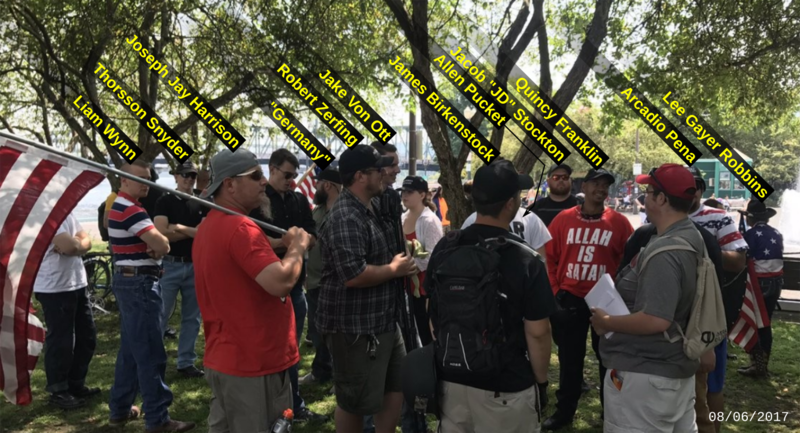 Quincy Franklin is seen with fascist organizers Thorsson Snyder, “Germany,“ Liam Wynn, Allen Pucket, and Jake Von Ott; as well as with Patriot Prayer activists Joseph Harrison, Robert Zerfing, James Birkenstock, Lee Gayer Robbins, and JD Stockton. 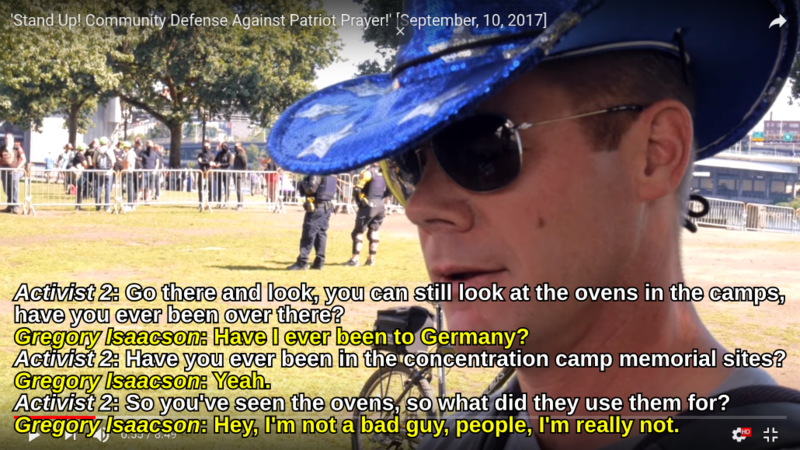 Gregory Isaacson, an Analyst at Portland Parks & Recreation, has been at countless Patriot Prayer rallies, where he threatens and harasses counter-protesters. He has previously been recorded on video denying that the Holocaust happened. He has been seen hanging out with Identity Europa, Proud Boys and other white supremacist groups and individuals at Joey Gibson’s events. 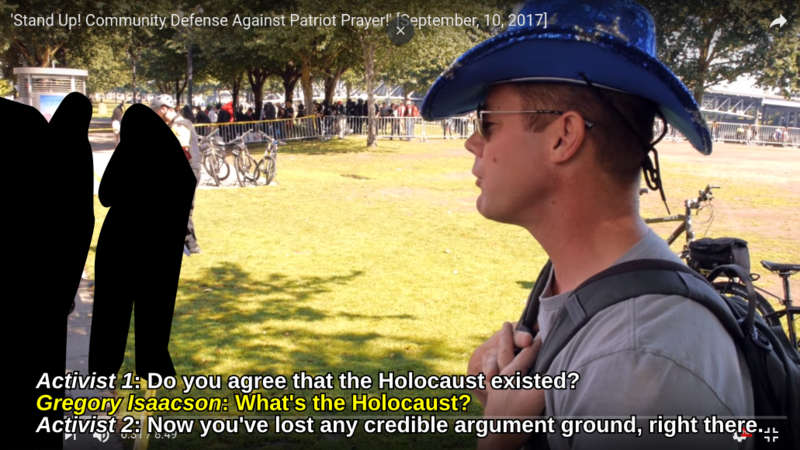 Gregory Isaacson engages in some holocaust denial at a Patriot Prayer rally. 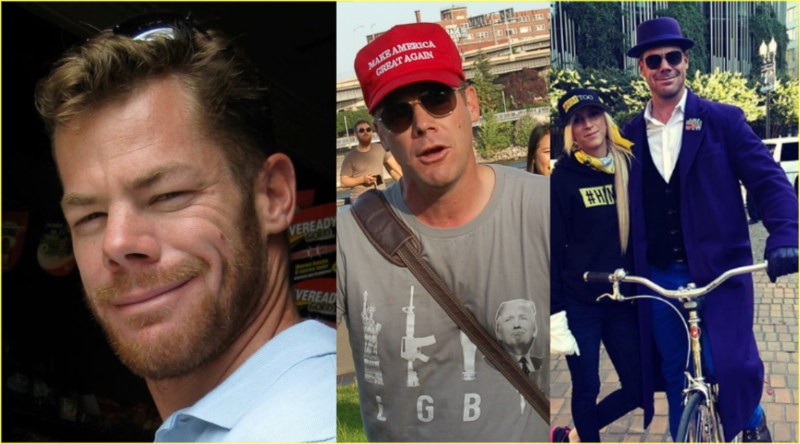 Gregory Isaacson is seen with violent Proud Boy Travis Nugent and other Proud Boys who are marching in a crowd that includes neo-Nazi Thorsson Snyder, PDX Stormers member “Might is Right,” Proud Boys Jason James and Sean Mitchell, and violent far-right youtuber Kerry Hudson. 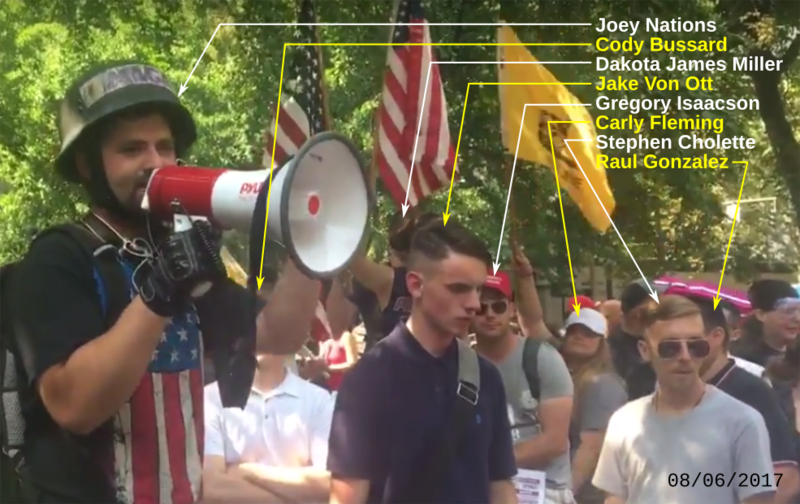 Gregory Isaacson is seen with a number of fascists in attendance at Joey Gibson’s violent August 6, 2017 rally including Jake Von Ott, Cody Bussard, Stephen Cholette, Dakota James Miller, Carly Fleming, and Joey Nations. It is not enough for the Portland City Council to condemn the white supremacists who are invading Portland’s streets and threatening our community. The Council must take concrete action by removing bigots from public jobs, where their influence can be used to harm the community. If this is truly a city government that wants to take a stand against white supremacy, they must take action, not just produce empty resolutions. If you know about other white supremacists and bigots working for the City of Portland, or have other information about white supremacist organizing, please email us at fight_them_back@riseup.net.